You can enter clinical notes into a patient's record. 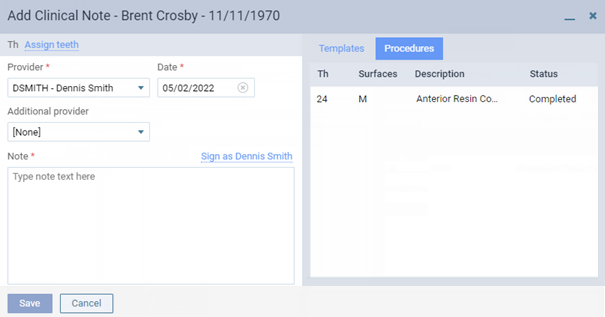 Note: For your reference, any of the patient's completed and treatment-planned procedures for the selected date appear on the Procedures tab. Type a clinical note, and/or add a clinical note using a template. Note - The text of the note. You can type free-form notes. You can also insert a note from a template where the text cursor is positioned by selecting one of the Templates, responding to prompts to enter data (if applicable), and then clicking (or tapping) Done.